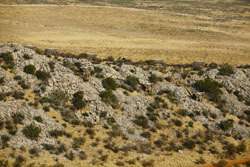 There are only 20 chalets at Dolomite Camp all nicely spread out amongst the rocks on a Dolomite hill in the western side of Etosha national Park. 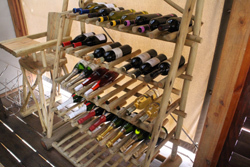 It has a special ambience of privacy and seclusiveness that makes every stay at Dolomite Camp a special one. 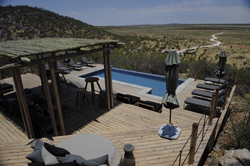 The two small restaurant areas mean you will be sitting with a maximum of twenty people while our bar and swimming pool areas are pleasantly dotted amongst the rocks all with spectaculaer views over Etosha park. 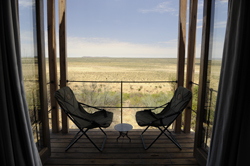 Dolomite Camp is your home inside one of the last remaining wildlife sanctuaries in the world. The main area, with a restaurant, bar, sunset deck and infinity swimming pool overlooking the surrounding plains, offers the ideal place to relax and rejuvenate, while savouring infusions of cocktails or being seduced by the magical authenticity of Namibia’s outback. Two fireside bomas present the perfect opportunity to savour Etosha National Park’s night life while revelling in adventure tales. The Camp features 20 Chalets built on elevated wooden decks on and around the outer edges of a Dolomite ridge. 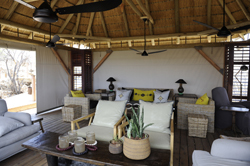 All rooms are built with thatched roofs, canvas walls and large, wooden-framed retractable doors allowing spectacular panoramic views, have a tea/coffee station, desk, hair dryer and mosquito nets. Rooms are elegantly furnished with local and regional fittings and equipment, using natural fabrics to create a natural and ethnic ambiance. 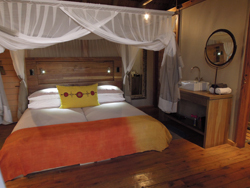 The two Deluxe rooms have in addition a double bed in each, own private plunge pools, spectacular sunrise view. · 6 x East-facing: 2 x beds, spectacular sunrise view. 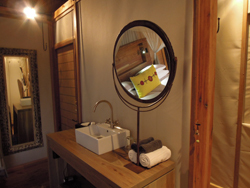 · 2 x East-facing Deluxe chalets: 1 x single and 1 x double chalet waterhole view. 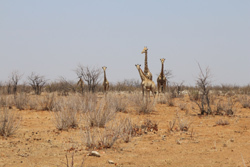 Desert elephant, Black Rhino and Lion are some of the more impressive mammals to be found, but not to be outdone you’ll find a myriad of smaller mammals, birds, reptiles, insects and plants. Large herds of zebra, giraffe and antelope wander the plains around Dolomite Camp. Black and white rhino are present in numbers, often at Klip-pan waterhole. Previously endangered species such as the black rhino and black-faced impala have been successfully bred here. 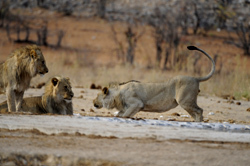 Wildlife excursions are conducted by professional and knowledgeable tour guides. Apart from the normal Etosha game viewing a special attraction of the Otjiovasondo area is the opportunity to see both the Plains Zebra and the Mountain Zebra drinking or grazing side by side and spotting the rare Sable Antelope. 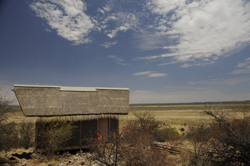 For travelers making the journey between Etosha and Swakopmund, this lodge provides the ideal midway stopover, whilst allowing guests to experience the true wilderness of Damaraland. 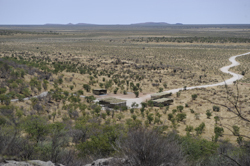 Located near the Dolomietpunt waterhole, this exciting new camp gives access to a whole new section of the park which up until now has been off limits to those without a permit. 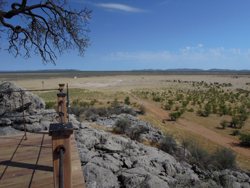 This western side of Etosha National Park has different vegetation to the rest of the park, being made up of a mixture of scrub mopane woodland and sandy acacia shrubland. Dolomite Camp has a fully equipped restaurant with a view of the surrounding landscape. 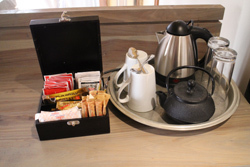 Seating a capacity of 40 pax, the service is personal and intimate. 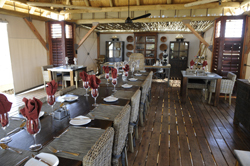 Whilst an international a la carte menu is available, the Chef also serves a range of Namibian contemporary lifestyle cuisine. 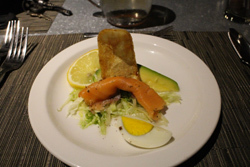 Specific diets such as vegetarian, kosher etc should be indicated with your reservation. 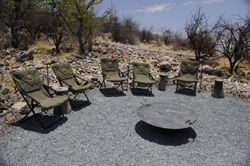 Nestled in the dolomite outcrops of the pristine western Etosha National Park, Dolomite Camp offers an intimate experience of one of the most scenic areas of the Park. 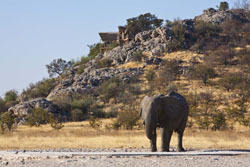 Access here is via the previously restricted tourism route through Galton Gate in western Etosha. 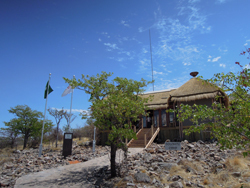 This is the first camp to be built in the far west side of Etosha National Park, opening up an area that few people have accessed before. From Galton Gate Guests can access the camp from the Galton Gate from there it is approx 45km to camp. Driving from Windhoek 590km take the B1 past Otjiwarongo 250 km, turn on the C38 towards Outjo, then on the C40 towards Kamanjab, then turn right on the C35 towards the Galton /Otjovazandu area - 340km. All tar road except the last 45km inside Etosha Park.